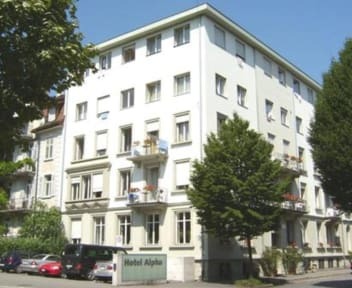 The Hotel Alpha, built in 1903, is located in a central and quiet location. It is famous for its familiar and friendly atmosphere. It has recently renewed the lobby and the rooms. All the rooms are simply furnished but bright and clean. Breakfast is available from 07:00 to 10:00. There is no restaurant or bar in the hotel but there are several in the surrounding area of the hotel. 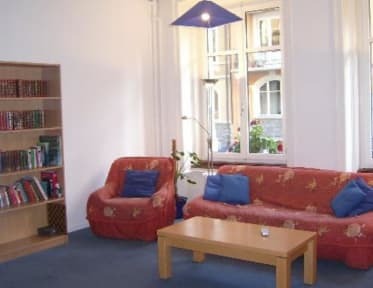 Comfortable and clean rooms with one, two or more beds and shower/toilet outside on the same corridor. Double rooms with attached bathroom are available only on request. Within five minutes walk you will find all the nice spots from Luzern. Take a walk through the cute old town of Lucerne with the famous wooden Chapel bridge and the amazing Concert Hall KKL. Take a cup of coffee in front of the lake and have a look around you on the Swiss Mountains. Cancellation policy: without costs until 1200 on arrival day. No-show will be charged with the rate of one night full. Pets permitted. No extra charges. Private Hotel-Parking CHF 15.00 per night. PLEASE NOTE: payments are only accepted in CHF. If cancelled before the date of arrival, no fee will be charged. If cancelled on the date of arrival, 50% of the first night will be charged. Very clean, great location, kind service, great breakfast. Highly recommend. I loved this little place. Perfevtly clean amd quiet and walkable to everything. Staff is super friendly, too. Really supportive and engaging staff who go out of their way to help. The hotel is almost perfect,nice staff,free breakfast is excellent, 10 min walk to central train station where you can see most of the major attractions. This was a really easy place to find, and the location is great. My room was light, airy and clean. Breakfast had a good amount of options. Definitely more of a hotel feel than a hostel, so if you’re looking to meet other travelers this might not be the place for that. Bring earplugs bc the doors are loud when they close. This was by far the cleanest hotel for the best value in all of Luzerne. My husband and I stayed here for two nights and loved every minute of it. The bathrooms were so clean and it never felt like we were sharing it with other rooms on the floor. The only thing I would suggest is more WiFi extenders. We were placed in a room that happened to be right out of the WiFi range (103) so we kept getting signal in and out which will not be fun on our cellphone plan. We booked a double ensuite room. It was basic (no TV) but spacious and clean (as was the bathroom). It's only a 10 min walk away from Luzern's central station and on our arrival they gave as a free travel pass (Passepartout) to travel around the city and it also gave us discounts for the train and cable cars to go up the surrounding mountains. In general our stay was comfortable although I still find it's too expensive compared to other hotels in Switzerland, Luzern is very touristy. Clean hotel and friendly staff. Location is a bit far from hbf. Having a visitor pass for transport is a plus. Very basic hotel with no aircond and fan. Breakfast is adequate though there is no hot food. Price is acceptable in this very expensive country. A Neat, clean, symple room. I stayed a 3-bed room Oman business. Moderate walk distance to the Luzern station. There’re was no TV monitor, but free WiFi. I’s a good policy. Pros: The beds are comfy, facilities are clean, location is quick walk to the top spots to see in Lucerne. Cons: Beware light sleepers! Extremely thin walls and creaky floors. Because the bathrooms are shared there is high foot traffic on the creaky floors which wake you up at night. The neighborhood residents extra loud at night and windows are thin. Rooms need some real curtains, we had to hang a comforter up on the window to block light. Breakfast is just ok. Some creepy long term guests.